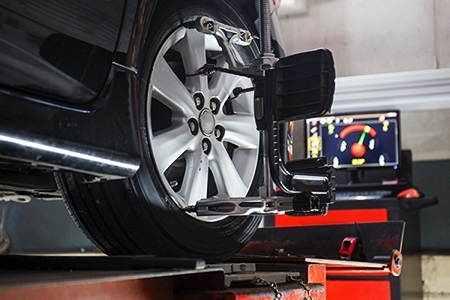 If you haven't already, you should definitely check to see if your wheels are properly aligned. Do you experience your car going to one side, rather than driving straight, when your hands are off the steering wheel? Then it's time to have an alignment on all four wheels. Although alignments are not often mentioned or talked about, they are actually crucial to the continued high performance of your beloved Honda vehicle. By adjusting the angles of the wheels to set them to Honda's specification, the tires will wear out at a slower pace, so you won't need to replace them sooner than later. Performance-wise, proper wheel alignment reduces rolling resistance, which means that the tires have it easier moving at a forward motion. As a result, the gas mileage is enhanced, thus cutting down the amount of fuel your car consumes. Also, properly aligned tires are better absorbers of road shock; the result is better handling and braking. Not to be combined with any other discounts. Offer Expires 04-30-2019.